Ulleung-do is an island on South Korea’s East Coast which is home to a biodiversity and geography only present in volcanic islands. Its vulnerabilities are similar to those of other island economies - the population, agriculture and infrastructure are mainly concentrated towards the coast, limited connectivity to and dependency on the mainland, rigorous tourism - all of which, in addition to climate change, cause a looming threat to the ecology. 30 Korean and international participants set off to the remote Ulleung-do to imagine the future of the island in collaboration with the local residents. For five days, the SHINBISUM workshop took place in the JangHeung Arts Centre, a strategically located yet abandoned school site overlooking the sea in Sadong ri. 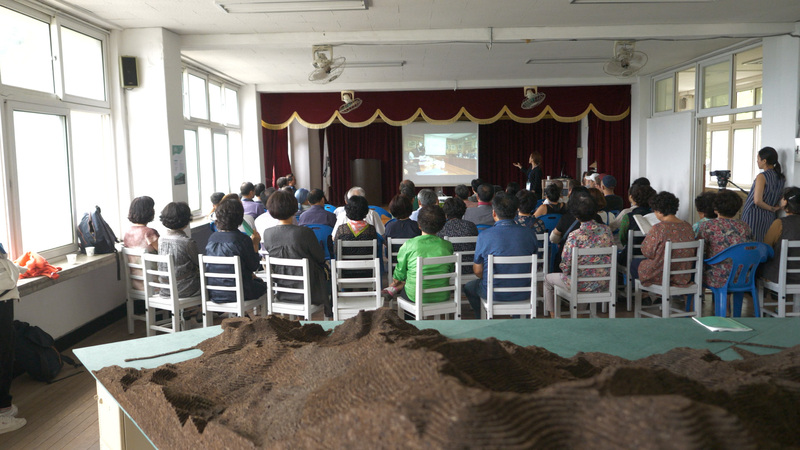 Three overarching subjects emerged over the course of the workshop: infrastructure development, tourism and the natural ecosystem of the island. Sadong ri is a district in Ulleung-do where the new port is under construction and a new airport is proposed; projects that have received mixed reactions from various actors. While some of the residents strongly advocate the need for better and faster connections to the mainland, others are skeptical about its impact on their island. The government, although willing to support growth, is not aware of the impact that these projects could have on their surrounding. Big infrastructure projects such as this one always come with patterns of development that have been seen in many cases around the world: wreckage of natural ecosystems, influx of tourists and over-construction. On the island effects of unnecessary construction is already being felt in the form of landslides, subsidence (sinking soil levels) and lack of usable water. However, there is no regulation to monitor the effects of development. Besides, the traditional economic activities of the island, farming and fishing have been declining for years leading to an outmigration of a local population. Many of those who have been forced to leave the island in search for better prospects have kept a strong tie to it and are interested in its future. Along Sadong’s coastal road where the new port sits, it is easy to see the direction of development toward which Ulleung-do is headed. Multi-storeyed hotels for tourists interspersed with restaurants boasting Ulleung’s special squid and herbs dot the coastline. While the roads are well-laid, there are no pedestrian pathways making it difficult to enjoy a walk along the coastal road. Just off the road, gigantic tetrapods, almost alien looking, form clusters in the sea acting as wave breakers. The tetrapods are also a precursor to allow for the construction of the future naval base. On one end is a small beach, where amenities for tourists have been provided, such as a children’s pool and a deck. Development in Ulleung-do seems to be oriented towards this coastline, targeting the tourists. On the other side of the coastal road lies the mountains and a breath-taking greenery which is home to a myriad of indigenous herbs, plants and trees. The wildly grown Bujigangyi not only makes for delicious dishes but also has proven medicinal properties to relieve asthma and bronchitis. A government sponsored monorail system makes it easy for farmers to navigate the steep slopes and transport their harvest. Interviews conducted during the workshop indicated that many residents agreed that the homegrown flora was one of their riches and that more incentive should be directed towards its research and cultivation. The tourism industry at Ulleung-do is largely fed by Korean families who stop over at the island before heading off to the famed Dokdo. Currently 400,000 tourists visit the island annually out of which 45% are headed to the Liancourt rocks, only using the island as a stop-over for a night at most. Some hopeful projections estimate that 1 million tourists will visit Ulleung-do in the coming years with increased connectivity to the mainland. Already, their presence is evident in the landscape: national flags, renditions of the Dokdo anthem along ports, countless hotels, viewpoints, restaurants and souvenir shops; a kind of mass tourism that has destroyed many beautiful places around the world thanks to over-construction and infrastructure development. 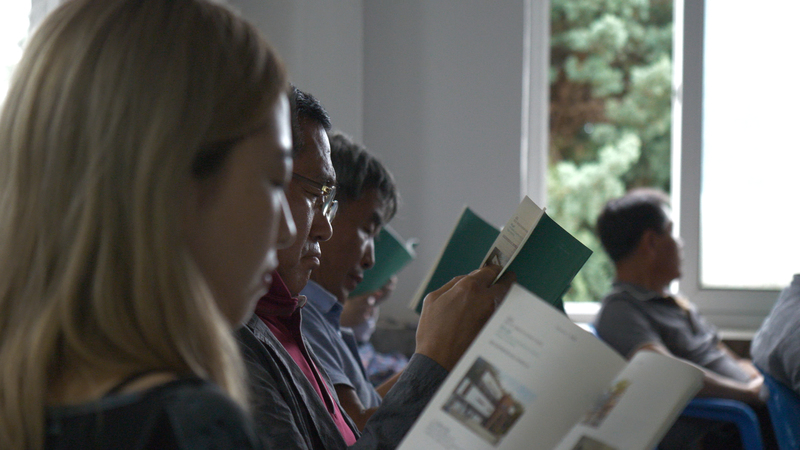 The SHINBISUM workshop tried to think of alternative development models for Ulleung-do to that could turn its vulnerabilities into opportunities. How to better the existing infrastructure projects without causing more damage to the coastline? How to use the knowledge in the natural systems of the island to create new, sustainable forms of economic growth? How to develop tourism without destroying the resource that makes it attractive in the first place? The workshop brought together people from various backgrounds and with different viewpoints. People from India, Switzerland, Germany, Italy, Poland, USA and various parts of Korea came together to interact with the locals of Ulleung-do. It identified areas of potential that could steer the growth of the island in different directions. There were architects working with marine biologists, urban planners working with civil engineers, education experts coming together with designers, all to bring a diverse and mixed approach to rethink development on the island. 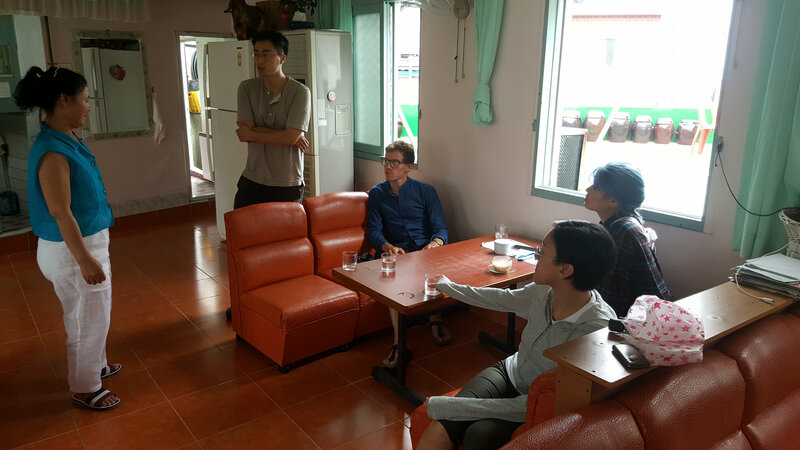 The participants heard from and collaborated with the locals directly so that their ideas were rooted in user needs. The residents were not aware of the impact of the big development projects proposed on their island and were mostly in support of better connectivity and increased prices for their land and property. For the locals, it was eye-opening to see people from around the world come to their small island and find value in its different corners; broadening their perspective toward the kinds of development possible for their island. The diversity of backgrounds, professions and experiences led to a multifaceted range of projects. Some participants focussed on architecture and urban projects. One proposal dealt with the abandoned, underused property on the island that could be adaptively reused for functions that answer the needs of the community, like a bathhouse or a hair cutting salon, or for setting up small businesses that could feed the economy of the neighbourhood. Another dealt with maximising the potential of the existing beach infrastructure to create a public space where both residents and tourists could interact with each other. 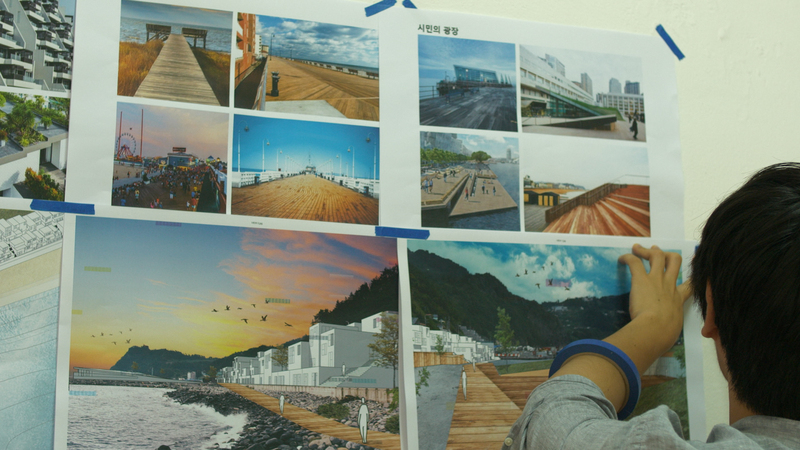 Some projects aimed to stimulate the imagination of residents: education models that could attract a different kind of people to the island changing the demographic composition of the typical tourists who visit the island and projected scenarios of Ulleung-do in ten years considering different paths of development. A project dealt with strategies to use the vast knowledge contained in the natural systems of the island and make it economically and socially profitable while respecting the ecological make-up as the catalyst of the project. One of the participants, a Cordon Bleu chef, worked with local ingredients and the local women to create easy, season-specific dishes. The common vein amongst the projects was the need for a value generation in the island when contemplating future growth. Creating value through architecture to spark a new kind of tourism, through research and development of indigenous marine species to fuel comprehensive conservation programs, through networks of existing know-hows and making it available on global platforms. International case studies shown by various speakers showed how these models could be specifically tailored to Ulleung-do. Fast paced development is the modus operandi in South Korea but there is a shift in the thinking amongst both the government and the people towards the way that it is done. 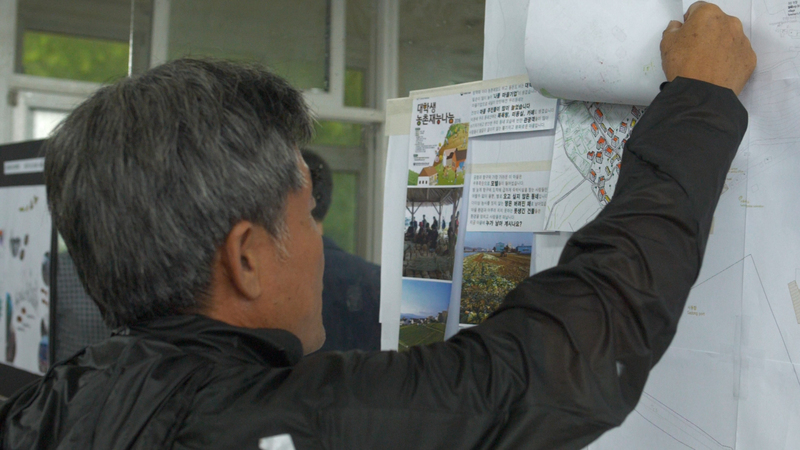 There is an inclination to consider the quality and contents of the development as well.The enthusiasm and interest with which some of the locals responded to the ideas is only testament to the fact that development in Ulleung-do need not follow the typical route where small island economies fall victims to the tourist trap and fail to thrive. 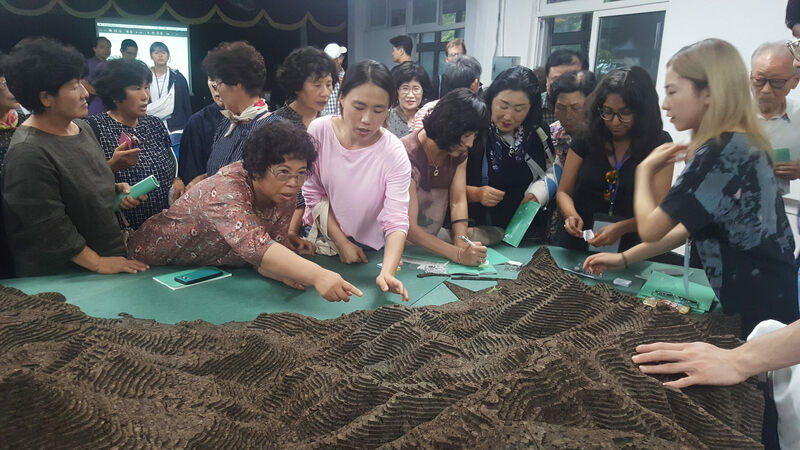 The willingness of the government to implement certain proposals and the genuine interest of the local population could mean that Ulleung-do could soon become the example of an island that forged a path for a new alternative to sustainable development. 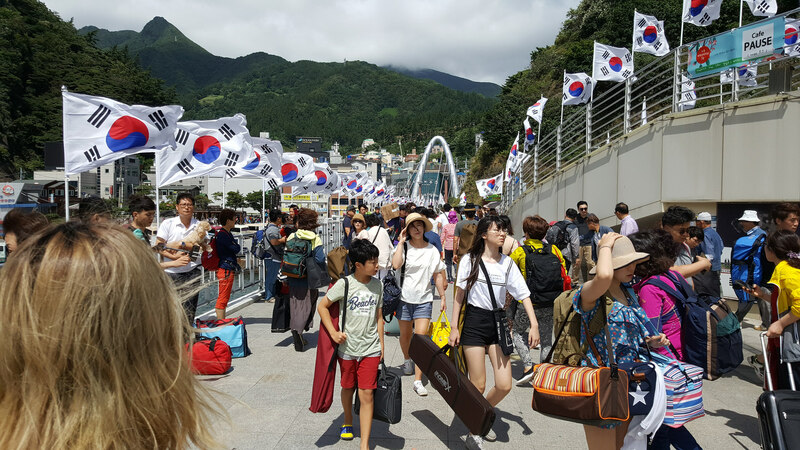 Arrival at Dodong port, lined with Korean national flags and thronged with tourists. Brainstorming and identifying familiar places on the model. Participants interact with local residents and carry out various interviews. Visitors examine the proposals that are exhibited. Chef Kim prepares for a final meal with local herbs and ingredients.